MD6702 is wide model of MD6701 (100 mm wider and seats layout as 2+2 and maximum seats reach 26+1 pcs).MD6702 is unquie in China Market.With outstanding design from original Toyota coaster, luxury generous space, comfortable seating ,easy manipulation , perfect commercial vehicle function, leading technical peformance and humanity concept, K series buses will offer you peak enjoy experience. Engines installed are all proved to be stable & quality by local market. Like Cummins engine, Yuchai engine,Isuzu technology engine from JMC ... ... All vehicles are treated with cathode electrophresis ,which highly imporve the vehicle corrosion resistance. 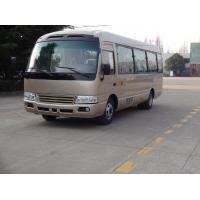 It bring you pleasure and respected enjoy because of Luxury generous space, comfortable seating, freely control, complete commercial vehicle functions and technical performance .The high quality materials and a wide range of high-quality achievements experience made the company become the leading of commercial vehicles.